There is plenty to do in Beaufort SC this weekend, and this event is nothing short of fantastic. 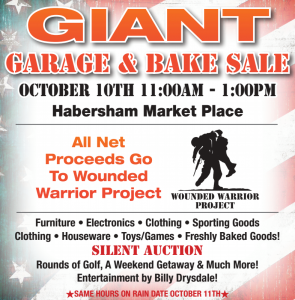 Starting at 11am at the Habersham Marketplace, there will be a huge garage sale which will offer anything from furniture to toys. During the event, there will be a bake sale that will be just as big, along with live music from Billy Drysdale. There will be even more excitement, with a silent auction with a variety of things to bid on. Be sure to stop by, as the event ends at 1pm. Not only will you be able to shop and enjoy live music, it will all be for a good cause. All proceeds go directly to the Wounded Warrior Project. For more information on this event, or any other events happening this weekend in Beaufort, visit: www.eatsleepplaybeaufort.com!